Till last week, the only thing I remembered from my BE degree was my examination registration number. I finally forgot that 6 digit number. So officially I have retired from my Engineering degree. To honor me, Brendan McCullum retired from One day international cricket. I am an Electronics and Instrumentation engineer. If you ask me anything from any subject during my Engineering degree, I will just give a blank stare. I don't remember anything now. I vaguely remember that I had a subject called Fluid mechanics in my 6th semester. I also remember that I had a subject called field theory in my 5th semester. Then there was this huge book written by A.K Sawhney. If Philip Koetler's book on marketing is the Bible for all MBA students who specialise in marketing, then AK Sahney's book is the bible for all Instrumentation engineers. The only thing I remember is that I sold that book for 200 Rupees and bought an underwear and a Beatles CD from the money. I seriously don't remember anything else. Well! I remember all the cultural events that I participated in. I can write a book and publish it based on my Engineering days. But a lot of authors have already done that. So I won't do that. 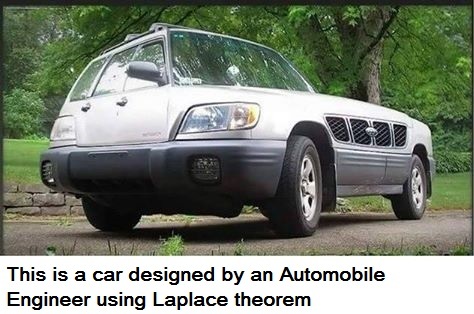 One thing that still haunts me is "Engineering Mathematics". I had one arrears paper in my BE degree and that was my first year Engineering Mathematics paper. I came across Fourier transforms (4th semester) and Laplace Theorem (5th semester). I still do not know how I cleared those papers. This is why I seriously doubt the credibility of University of Madras. Let me tell you How I flunked in my first year Engineering mathematics exam. I was a day scholar during my first year of Engineering. I was weak in mathematics. All the best mathematics students stayed in college hostel. Till two days before the semester exam, I tried my level best to study for the exam; but nothing entered my head. So I decided to study with my classmates who stayed in college hostel. That was the biggest blunder I ever did. It was a Sunday morning. The exam was on Monday. So after the church service was over, I rushed to the college hostel. All the guys were wearing minimal costumes and were roaming freely in the hostel corridors. As soon as I entered hostel, Edwin (EEE student) approached me and said "Machi, came for combined study? You have come to the right place". His words of encouragement was a tonic for me. He came along with me and took me to all the rooms in the hostel. All the rooms were filled with smoke. The guys were all high too ( I did my Engineering in Pondicherry. The college was affiliated to Madras University). I asked Edwin "When will all study for the exam". He calmly looked at me and said "Don't worry. We will start soon". Then we entered one room where Augustine Paul and co were playing a game of cards. As I entered the room, they welcomed me and allowed me to join them in the game. After a few games, they said it was time for lunch. So we went to the college mess and had our lunch. Once we were back, all the guys went to sleep. I again asked Edwin when they will all study. He looked at me with a cool look and said " Don't worry machi. We will start in the evening". I slept with he gang. It was a new experience for me. I have never been in a hostel environment and I was getting accustomed to the wolf pack. When I woke up at around 5 PM, no one was around me. I rushed out of the hostel room and saw all the guys in the college play ground. Some of them were playing cricket and some others were playing ball badminton. As I was a ball badminton, right back player, I joined them and played to my heart's content. It became 7 PM in no time and it was time for dinner. We again rushed to the college mess and had our dinner (chappathi) and came back to the hostel rooms. Still no one had opened their books. I started to panic at that point of time. I again turned to Edwin and he put his arms around my shoulders and said "Don't worry machi," Many of them started writing formulas in small chits. I understood that they were going to cheat the next day. I did not want to join them. So I asked Edwin to lead me to the room where people would actually be preparing for the exams. Edwin is a Maniratnam fan. He took out his purse and showed a passport size photograph of Maniratnam that he had kept in his purse. Edwin started to explain the film taking nuances of Mani Sir. 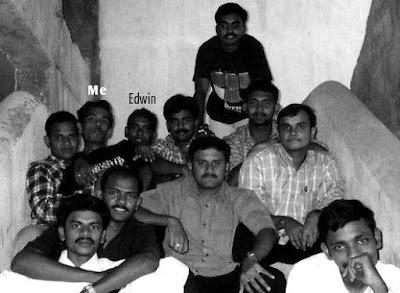 It seemed as though the spirit of Maniratnam had entered Edwin. Before I realised, it was 9 PM. Now fear set in and I started to panic. I had an exam to write in 12 hours time and here I was standing without even opening the book. Edwin again looked at me and said "Ok Machi! I will help you now". He opened his book and showed me some of the caricatures that he had drawn. He was a master story teller. I had no clue how I got sucked into his story. Before long, it became midnight and he yawned, thus showing the first symptoms that he was sleepy. He immediately packed his books, kept them in the shelf and lied down. I looked at him in disbelief and said "Please help me". He looked at me with calmness and said " Don't worry da. We will wake up early at 4 AM and I will guide you through some exam questions". I slept too with the assurance that I will get up and learn some short cut methods to clear the exam. When I woke up, it was 8.40 AM. I did not even have time to take a bath. I just brushed my teeth, wore my shirt and pants and ran to the exam hall. When I looked at the question paper, it looked like Rocket Science to me. I tried to fill the paper with random numbers and when I ran out of gas, I came out of the exam hall. The results came after 3 months. I had scored 12 marks out of 100. The pass mark was 45. I went in search of Edwin and I saw him talking to a few juniors (The first year students have joined by that time) about Maniratnam. I asked him how much he scored. 13 out of 100 was the reply. How did he get 1 more mark than me? This is one of the very few photos I have from my Engineering days. Edwin is sitting next to me in the picture. That was the first time I ever failed in a subject in my life in exams. Engineering Mathematics is indeed a Pakistan Terrorist. I had a good laugh :)! you are hilarious! Haha. After 3rd year, you and I were room mates. Eddy joined us in 4th year. It was a great ride indeed.